Now simply press a button and get the ultimate in cool shade and protection instantly. 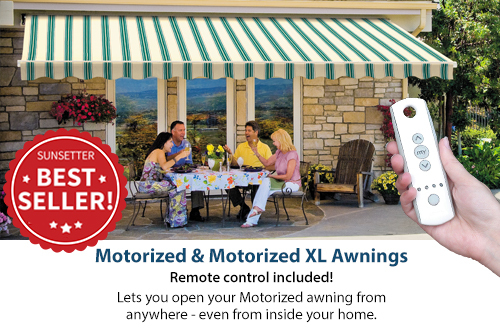 The SunSetter Motorized and Motorized XL Awnings operate effortlessly in seconds, so you can control the weather on your deck or patio. These awnings are "lateral arm" style. The motor operates strong support arms that open and close directly under the awning canopy. No vertical support arms are needed. 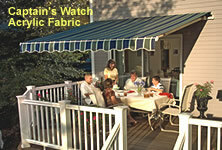 It's the finest motorized awning available today, unsurpassed for beauty, convenience, protection, and affordability. This remarkable awning gives you the same features -- or better -- than other electric awnings costing hundreds or even thousands of dollars more, including state-of-the-art lateral arm technology for superior performance and stability, plus a reliable Somfy® motor -- the best in the industry -- hidden inside the awning roller. • Up to 10 ft. 2 in. projection. Widths from 8 to 20 ft.
• Laminated fabric available on 8 to 18 ft. widths. • 11 ft. 8 in. projection. Widths from 14 to 20 ft.
• Both the Motorized and Motorized XL have a standard 18 ft. plug-in cord, optional 24 ft. cord available.